After my last game I was really keen to include Windborn cavalry in my army. I really enjoyed the fact that they can be more efficient in terms of shooting but also provide another element to the force - Windblast spell that can be quite useful. In particular in pushing enemy units away from their objectives. Fortunately, Jeff had time for our rematch and he brought Trident Realms army again. There were some changes based on our last battle too so I was also very curious about new version of the army. This time Jeff did not bring Gigas, broke one horde of Horrors into two Regiments, added two Horror Eternals and two regiments of Tidal Swarms. He also had only Thuul Mythicans with Bane Chant and Alchemist Curse. It made the army look even more homogeneous but I think it was more dangerous. First, from my personal point of view, it had more units than mine and that is already bad news. Second, by having 3 Thuul Mythicans and 2 Depth Horrror Eternals there was enough inspire presence to cover every unit, even if the army would spread wide. With even more emphasis on melee, I would face the army that can loose some units and still have quite a few spare to inflict significant damage. This army, composed from the regiments mainly, had quite good nerve and it means that the low defense of the units disadvantage is mitigated. In order to put up a decent fight I had to use my strengths well. I had advantage in the shooting that would be helpful, even with Stealth on many units. My army was also generally faster and a bit more maneuverable. The goal would be to inflict some damage before inevitable melee (to even the number of units at least) and to create favorable fights, preferably with some flanking charges. In order to accommodate new unit, Windborn cavalry, I had to make some concessions. I dismounted Army Standard Bearer and removed Staying Stone and Brew of Haste. I added Dwarven Ale for the Drakon Lord though, as I had some spare 10 points. 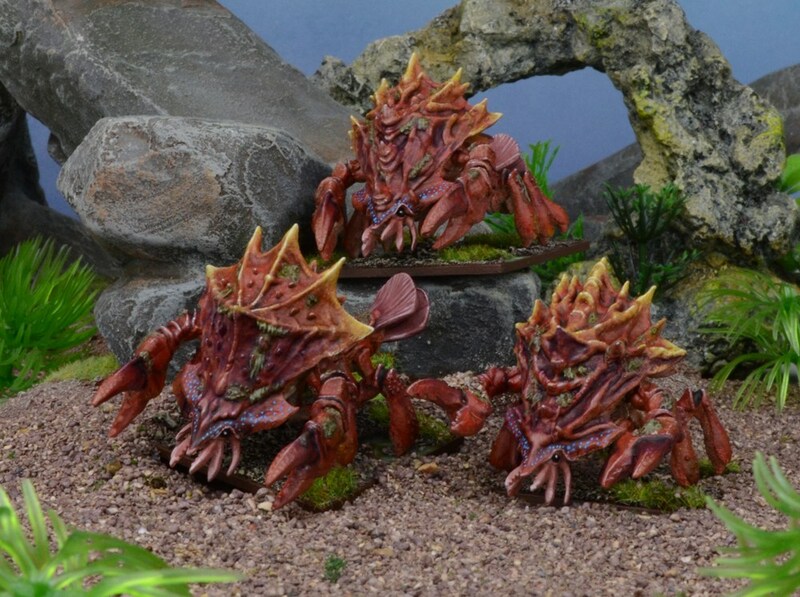 In general, this army should fight in the similar fashion as the previous version. Addition of Windborn cavalry improves shooting efficiency a bit and provides new tool to move enemy units. Hopefully, I would be able to use it to an advantage. For this game I rolled on Epic Dwarf map generator and got map number 6. 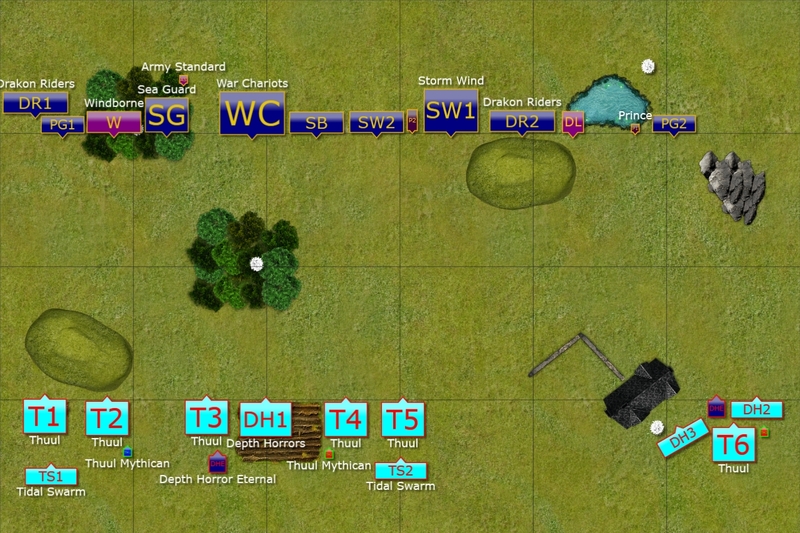 Deployment and objectives placement (two objectives are under T1 Thuul and Windborn). We got Pillage as the scenario. Usually, I try to spread the tokens. I have quite a few units so the idea is to force the enemy to choose between thinning the battle line or abandoning some of the objectives. This time, however, we both had enough elements to play the same game. It was already interesting to see how would we try and use that to our respective advantage. When Jeff place one of the objectives in the middle of the woods I knew I had to have something to counter his advance. The forest nicely covered his units from my shooting and any Thuul regiment entering the woods would greatly benefit from combination of Stealth and cover or Ensnare and hindered charges. Hence, I decided not to push directly against such threat but use units on the flanks of the formation that was deployed on the left and center. 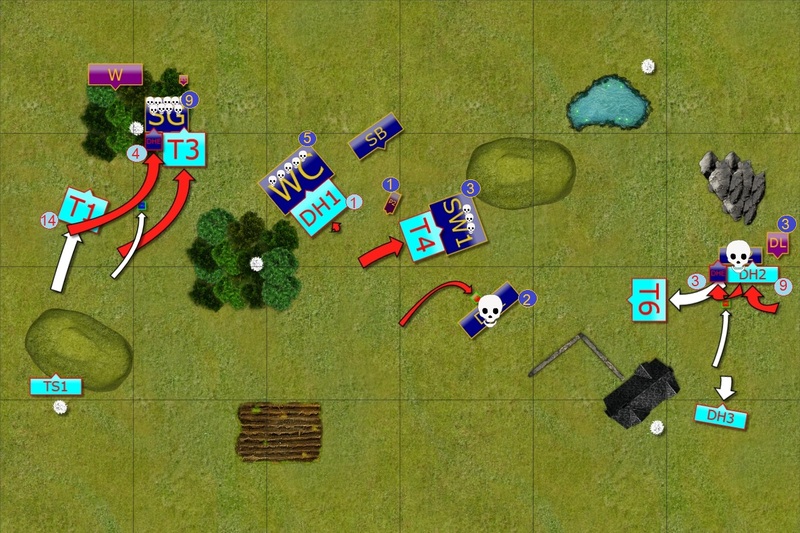 The plan was to use the shooting to rout one of the units that would go into the open, create the opportunity for Drakons and Palace Guard to exploit the gap and use Storm Wind cavalry to overwhelm Thuul T5 to threaten the flank from the other side of the forest. If that worked I would have created a dilemma for Jeff. 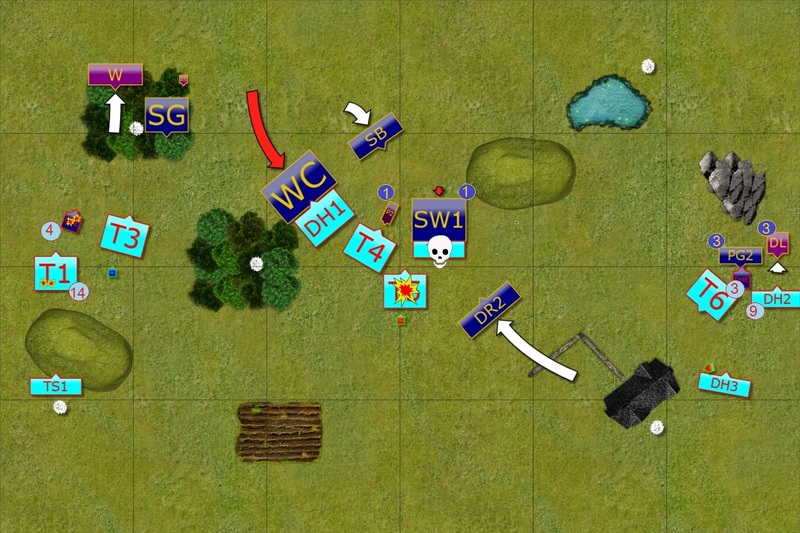 To advance against softer shooters but be threatened with the envelopment or camp around the forest but still face the outflanking units while being shot at. In particular, I hoped to mess up with such formation due to Windblast spell ability. At the same time I wanted to use four elements on the right to at least stop the enemy and contest the token in the bottom right. I won the roll off but chose to go second. 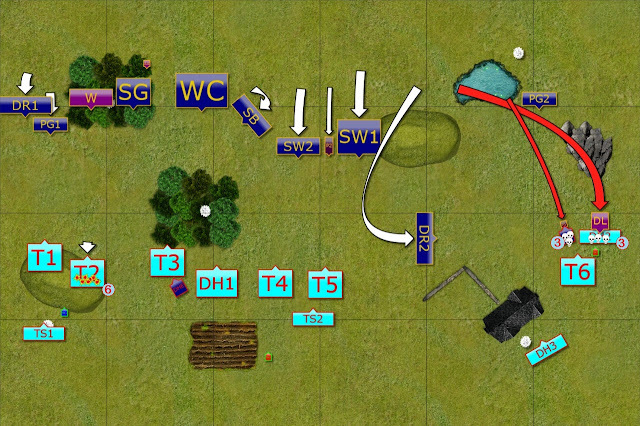 The reason was that my shooters were not yet in good position to inflict damage but if the enemy units moved, some of them would go into the open. Or slow down the advance. At the same time, with longer range of movement I was able to attack turn 1 if needed. Having last turn would also allow me to use Windborn to push enemy from the objectives and/or add my own units to contest/control them. Last but not least, advancing army would possibly allow Drakons and Lord to land in good spots and threaten the flanks. Nereticans advance at a double. The army of Nereticans advanced at a double but not recklessly. The majority of the forces on the right and center used the nearby forest as a screen against Elven archers. 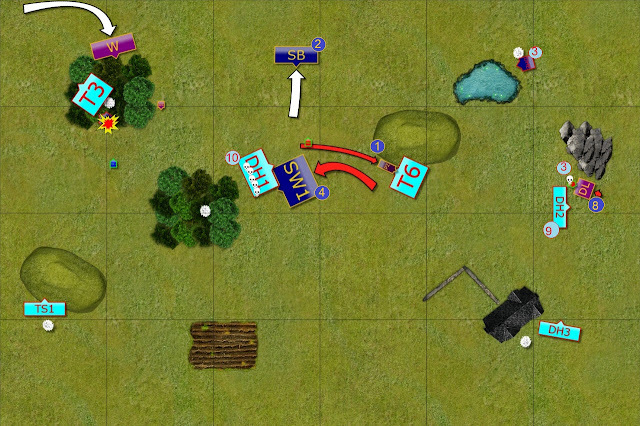 Elves attack on the right flank. 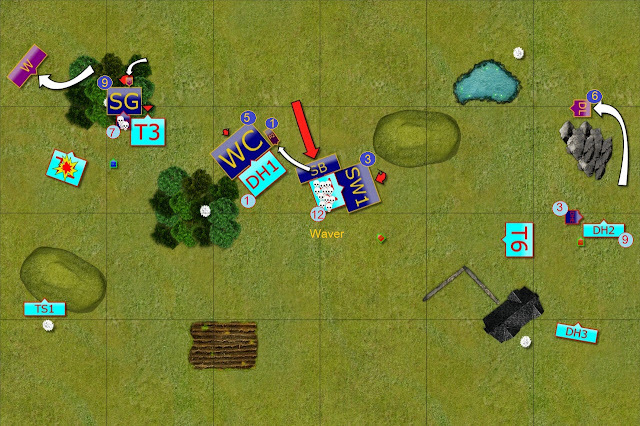 The units on the left flank opened fire and one of the Thuul units suffered some damage despite their Stealthiness. 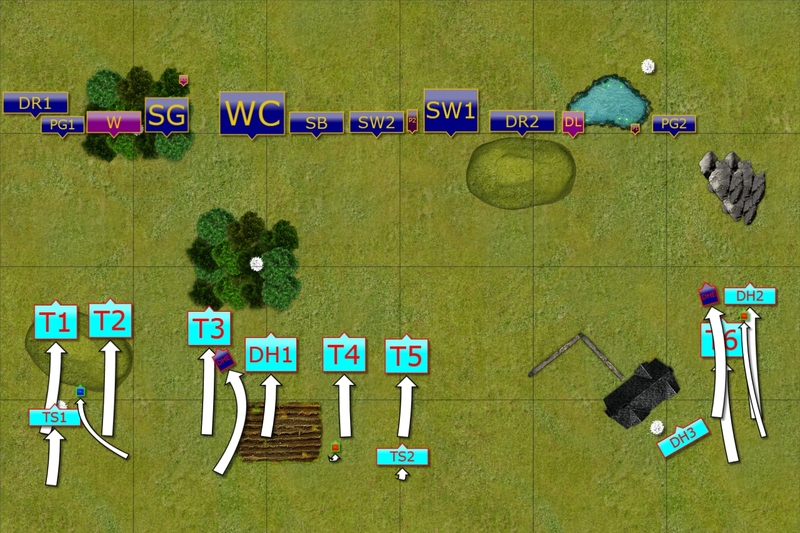 The cavalry in the center moved to positions to attack their enemies while the units on the right flank charged already. Drakon Lord and the Flying Prince aimed to stop the advance of the enemy, box Thuul regiment behind the first line of Depth Horrors and allow Drakon Riders and Palace Guard (Edit: I did not show the movement of the unit towards the Depth Horrors on the diagram, I apologize for this omission) to get into positions for the second wave of the attacks. The battle line on the left and in the center moved forward as one again. While the units were approaching effective charge range of the Elven army, only front was presented and Elves had some difficult decisions to make. On the right flank the Horrors counter charged Elven heroes, while Thuul regiment pivoted to face the Drakons. Some claim that attack is the best form of the defense and Elves definitely tried to prove it. 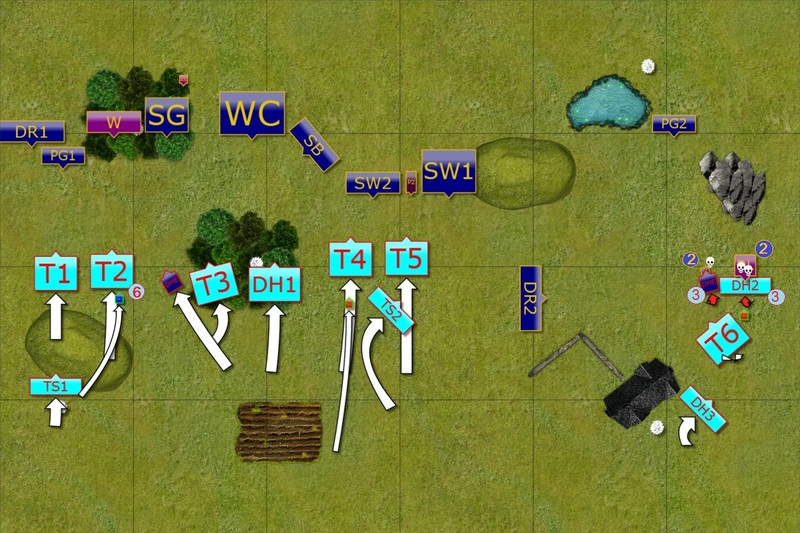 Units committed to the fight on three directions at the same time. On the left, Drakon Riders and Palace Guard charged Thuul Regiment but despite significant damage done, the unit held its ground. The regiment next to it was routed by the shooters, however. Unfortunately for Elves, this result opened some paths for the enemy to counter attack. Heavy cavalry in the center also charged and did some damage too. Yet again it was not enough to rout the enemy regiment and reposition to outflank other units. Finally, Palace Guard charged together with the Drakon Lord but they too failed to break their enemy. Now it was time for the army of Trident Realms to counter attack Elven units that failed to break through. Elves risked much more than it initially looked like and paid the price for their reckless attack. On the left, Depth Horror and Thuul regiment charged exposed flanks of their respective foes and routed them. In the center, Depth Horrors and Thuul destroyed troop of Elven knights while nimble Swarms intercepted bigger regiment. On the right, using the opportunity iven by the Drakon Riders that did not engage earlier, Nereticans killed the flying Prince and wavered both, the Palace Guard and the Drakon Lord. The losses were big but the battle was not yet finished and Elves kept on fighting. Windborn and Sea Guard aimed at their respective targets but neither could gain any significant effects. Stubborn Thuul refused to run while Depth Horror Eternal was not yet harmed enough. In the center, the War Chariors occupied the Depth Horrors to give some time for the Storm Wind cavalry to get into position to attack. Tidal Swarms were eliminated and one of the regiments of Thuul were finished by the Silver Breeze cavalry. The Drakon Riders also changed the direction of the attack and moved to aid the center of the battle line. Trident Realms army pressed their advantage. The units on the left flank charged Sea Guard but Elven marines valiantly held their ground. So did the War Chariots. Storm Wind cavalry also got charged but they held their ground. Unfortunately, reinforcements in the form of Drakon Riders got attacked by Thuul Mythican and were routed! Stubborn Thuul refuse to yield! Elves continued their now desperate fight. On the left the regiment of Thuul was finally routed but Sea Guard was not able to inflict substantial damage to get rid of the Depth Horror Eternal. 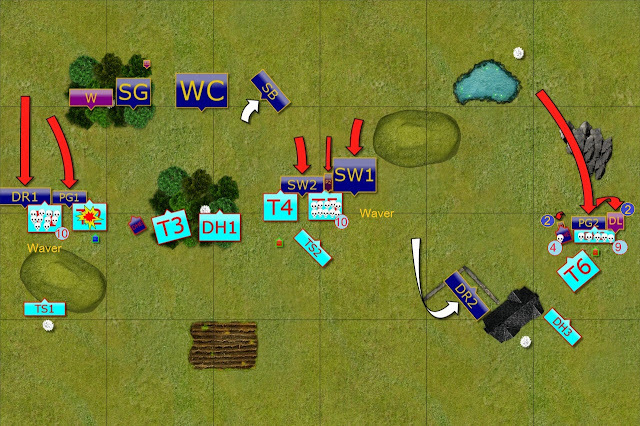 The units in the center were also unsuccessful as despite the significant damage done in counter attack, Thuul regiment held its ground regardless! Trident Realms units attack new objectives. 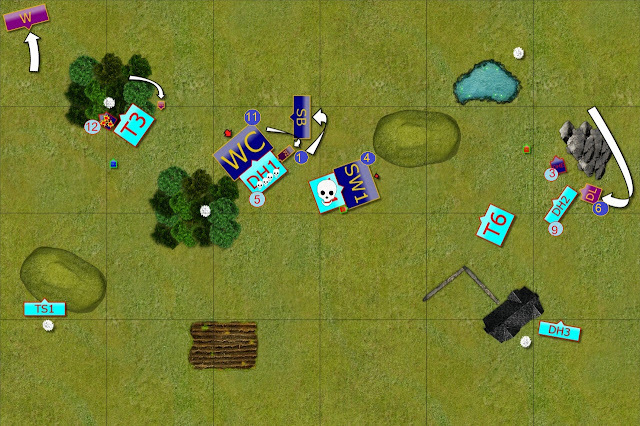 This time Sea Guard could not hold any longer and Elves lost control over one of the objectives. The War Chariots held somehow but as the cavalry was slowed down it was just a matter of time for them to perish as well. Another Thuul regiments is destroyed. Windborn cavalry aimed at the Depth Horror Eternal and yet again Neretican unit refused to break despite the damage done. At least Storm Wind cavalry routed their enemy. Nereticans move to control more objectives. With quite a significant percentage of the enemy units gone, Trident Realms army could start securing even more objectives. Elves had only few resources left and not enough time to change the course of the battle. But they made an attempt anyway. Windborn cavalry finally routed Depth Horror Eternal but still needed one more chance to shift Thuul regiment. Storm Wind cavalry needed to break the enemy unit and get enough momentum to get to the objective but the damage done was too low to rout the foe. Drakon Lord also attempted a risky maneuver to rout the Mythican. If succeeded he would have been in a position to destroy nearby Depth Horros too but it was too much to ask for as well. With the last attempt failed, Elves withdrew surviving units and conceded. Many thanks to Jeff for a great game and congratulations for a successful re-match! I thoroughly enjoyed this battle! Before I start analyzing my own mistakes and potential alternative moves, I would like to highlight how well Jeff was positioning his units and characters. He made sure that only front was ever offered to my potential charges and it really paid off. Even when the damage was significant, his units slowed down mine and often put them in even worse position for a counter attack. I would also like to stress how he used his pedestrian heroes in particular. It seems that many players assumed such heroes are inferior and not useful enough in comparison to their mounted or flying counter parts. This game should be a case study to the contrary. Thuul Mythicans are very flexible heroes, able to inspire nearby units, cast spells but also fight reasonably well in melee. I have never had a chance to attack them properly, even to stop them from casting spells. Jeff also used his heroes very well in order to stop Windblast to shift the units when he could prevent that. By simply placing the hero behind his unit, it was immune to the effect of the spell. Always happy to learn from my games, regardless of the results, I was constantly analyzing the turns of the game while writing this report. As usual, I discovered many potential moves I either didn't spot during the battle or simply didn't make the decision that could have been better. I think the deployment was not too bad but I would have made some changes. On the right flank I would have position the Drakon Lord further to the flank to be able to use the narrow spacing between the blocking terrain and edge of the battle field. On the left flank, perhaps a shift of the shooters towards the left would have been a bit better, especially that Windborn can shoot over friendly units without penalties. In my first turn I probably should have targeted Thuul T1 with the shooting. Thanks to that my attack with Drakon Riders and Palace Guard would have had better chance of success. I was happy to use the opening to land Drakon Riders on the right flank safely but it was perhaps a better idea to pivot them towards the center instead. This way I would have more options in the following turns while two heroes and Palace Guard on the right should have avoided fight and slow down the enemy. Turn 2 charges didn't work but I don't think it was a bad idea in general. However, I realized there were a few other options. One was to be more patient and pull back a bit with the units on the left and shoot. This way I would create an opening in the line of the enemy. If Thuul charged next turn I would have had units in place to attack as well. Another one was to choose targets differently and attack with more units so that if some of the charges failed to break the enemy I would have not given the foe the opportunity to get all these powerful flank charges. In order to achieve that I think the better solution would be as follows. First, attack with Drakon Riders and Palace Guard against Thuul T2. This unit was damaged so with the same amount of attack it would test on double 1's. Much better chances to rout them. At the same time Windborn would shoot at Depth Horror Eternal to push it back a bit, War Chariots would attack Thuul T3 to stop them from outflanking the Palace Guard and Silver Breeze would intercept Depth Horrors in the forest from doing the similar. That would have prevented the devastating counter attacks and perhaps stop the advance for a turn. I would get more time for Storm Wind cavalry to do their job and if at the same time second unit of Drakon Riders was facing towards the center, I would have an asset to attack the enemy from favorable direction. There is no guarantee it would have worked better but I would love to see what would be the result of such approach. 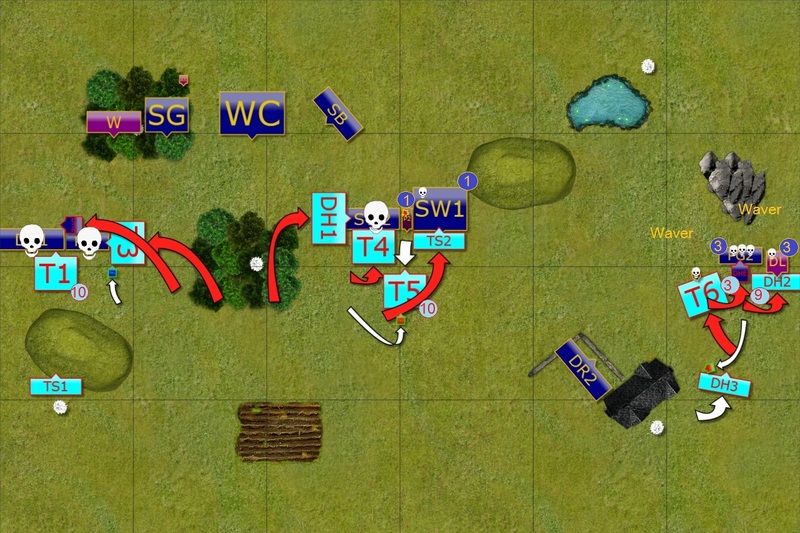 The situation was tough after the counter attack not only because I lost significant number of units but also because I simply could not rout the enemy regiments fast enough. I think it was good idea to move Drakons to help but I moved them too close for the Mythican to attack them. 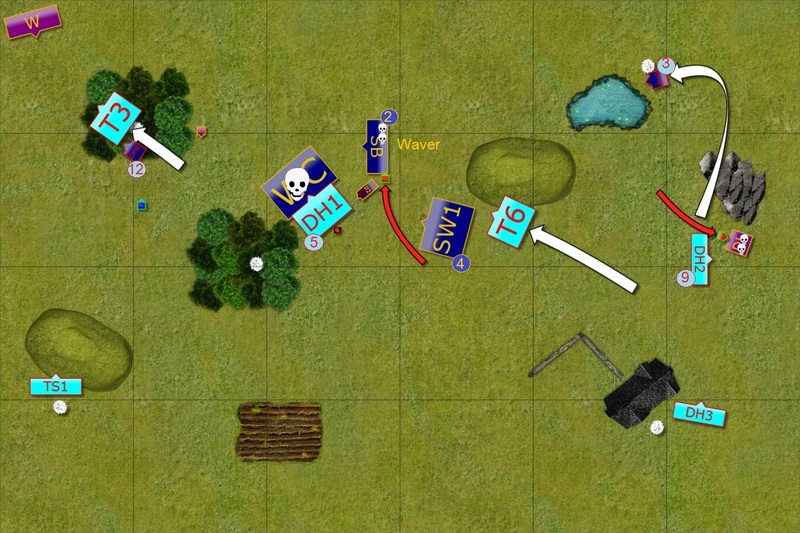 I also allowed it to attack from the front so even if they were not routed, the enemy hero would have blocked them. I should have presented flank to the Mythican instead. I withdrew my Drakon Lord too when he got some more damage and kept wavering every time he got damaged. First time I rolled badly on Headstrong but then he kept fighting. Perhaps I should have charged Depth Horrors instead as I had a good chance to finish them. I would have to face Depth Horror Eternal and Mythican at the same time but who knows, maybe that would have still worked. At least it would have slowed them down a bit. In summary, Jeff used his army very well, played to his strengths while I made mistakes, especially in turn 2 where I didn't not prevent the following flank attacks. From that moment I kept struggling to regain the initiative. In combination with the inability to rout the enemy units fast enough and the fact that every exchange of the elements were in Jeff's favor, I simply run out of time and resources to fight back. I hope you enjoyed the report because I personally learned a lot from the game and there is plenty to take from the way Jeff played for any army and player too.